African Zoology is undergoing some changes in 2015 including a new submissions site, a new online home as well as an increase to four issues a year. As part of these changes, we will be refreshing the journal’s cover. We are therefore putting out this call for the submission of images suitable for the new cover this prestigious journal. Do you have a striking image of African fauna in terrestrial, freshwater, or marine environments that you think may be suitable for the cover? In addition to the status of having your photograph featured on the cover of African Zoology, the winning entrant will receive a free 2015 print and online subscription to African Zoology. Submissions can be photographs of any African animal(s) in their natural environment. Submissions should ideally be in .jpg format and should be no larger than 500KB per image. Emailed submissions should be no larger than 10MB with maximum of 20 images per entrant. Submissions must be made by the original photographer, who must have a high resolution version of the image available on request, should this image be selected. The competition winner will be contacted directly and announced on the various NISC social media pages. 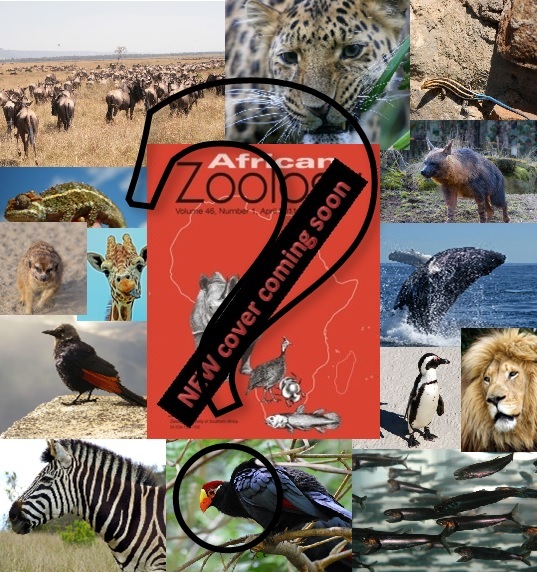 If you are interested, please email your images to info@nisc.co.za with the subject ‘African Zoology Cover’.